School surplus stock, apparently. All proceeds to Prisoners Abroad. UPDATE: (30 Nov, 9.00 p.m.) The spineless e-bay scumbags have removed the item from its listings. The last time we checked, Prisoners Abroad were set to receive a donation of £219 – and there was still six days to go. Will e-bay make it up to them? The BBC reports that Gillian Gibbons has been sentenced to 15 days in prison for “insulting religion”. The religion in question which has so exercised the slow-witted mullahs of Sudan is known as “Islam”, a 7th century personality cult invented by an illiterate camel trader with a penchant for warfare and pre-pubescent girls. Think L Ron Hubbard in a tent. For the duration of Gillian Gibbons’ incarceration we are holding an Insult Religion Competition in the comments. We’ll start the ball rolling: Islam, you scurvy dog! You are not fit to pick the winnets from a poodle’s arse. UPDATE: A prize, you say? Why, yes indeed. For once there shall be an actual, empirically verifiable prize for the winner of this comp. Leave it with me. I’ll get back to you. It will be worth winning. PRIZE! The winner of this competition will receive a “presentation pack” of the Royal Mail’s Christmas 2005 series of stamps, designed by Irene Von Treskow. There are six stamps altogether, the most famous being the Hindu Madonna and Child which provoked history’s first known case of Stamp Rage. They are not worth much at the moment, but you won’t find them in the shops. Pressure from Hindu groups led to the Royal Mail cancelling the print run in November 2005. Entries will be judged on wit and originality. Obscenity is acceptable, but if it is gratuitous, it does not stand a chance (I’m looking at you, Gareth). While we wait for news from Sudan, another example of religious protectionism rears its ugly head in Turkey. There a prosecutor is seeking to press charges against the Turkish publisher of Dawkins’ The God Delusion for inciting religious hatred and assaulting “sacred values”. The publisher could face up to a year in prison. A British schoolteacher working in Sudan has been arrested for allowing her pupils to name the class teddy bear Muhammad. Apparently it was a completely innocent mistake. Nevertheless, there have been reports that men have started to gather outside the police station where she is being held. What is the problem? Everybody knows that Mohammed is the most popular Christian name in the world. Now go to your rooms and think about what you have done. This morning on the BBC’s The Big Questions the former Archbishop of Canterbury Lord Carey agreed with Jonathan Bartley of Ekklesia that the blasphemy law should be abolished. Although he protested against what he saw as at increase in “offensive” material about Christianity, he said that Christ told his followers to “put away their swords” and didn’t seek to defend faith by force. No doubt he was trying to highlight a contrast between his particular brand of supernaturalism and a certain other popular brand. The Times of South Africa reports that “the Muslim community” has been offended by another cartoon. 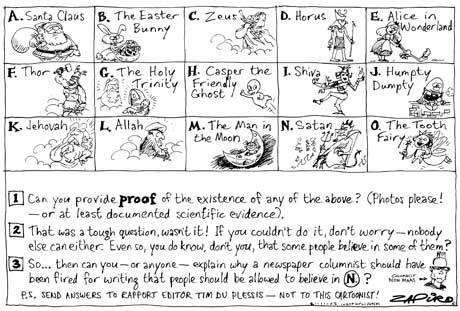 Jonathan Shapiro, aka Zapiro, drew the above cartoon in defence of a columnist who had supported the right of Satanists to believe what they want. Can you see why Muslims were upset? Yes, that’s right – the letter L box contains a depiction of Allah, their imaginary deity. He is sandwiched in between Jehovah and The Man in the Moon. So far the protests have amounted to nothing more than a flurry of angry text messages. A group calling itself The Muslim Judicial Council is “drafting a response”. UPDATE: (10 Dec) The editor of The Star, Moegsien Williams, has apologised, saying he would have censored the cartoon had he seen it before publication. The Johannesburg-based Jamiatul Ulama has graciously accepted the apology for what it had described as “a distasteful affront to our religious beliefs”, and has declared the issue closed. The multiple-award-winning Zapiro himself has not yet commented, saying he wanted to speak to Williams first. The latest on today’s Springer trial comes from This is London. These blasphemy laws should be shelved in dusty archives, not used as a tool to bring mischievous prosecutions against the Arts. Thirty years have passed since the last blasphemy prosecution, making the law ripe for repeal. It is a great shame that Liberty have gone down this road, and strayed away from their core activities of defending civil liberties, which we as an organisation support. no theological sense at all. UPDATE: (21 Nov) Reuters reports that the hearing is over and that the judges will deliver a verdict “at a later date”. We will keep you informed! As we suspected, The Mail was wrong to say that Ofcom directly criticised the West Midlands Police in its ruling on C4’s Undercover Mosque – the most that can be said is that its tone was occasionally incredulous at the groundlessness of some of the complaints. It is true, however, that all the complaints from all sources were completely and thoroughly dismissed. Those complainants included not only the WMP, but also 364 members of the public (“There appeared to be evidence that the complaints were part of a campaign”), the Islamic Cultural Centre and the London Central Mosque (for “unfair treatment” and “unwarranted infringement of privacy”), and the Kingdom of Saudi Arabia and their embassy (for “unfair treatment”) who were represented by the notorious Schillings (of the Usmanov affair, among others). In other words, usually addressed to paranoid adolescents, “It’s not about you”. One question does present itself: if the Saudi case was such an obvious non-starter, what on earth could have induced Schillings to act on behalf of the petro-dollar rich kingdom in the first place? I think the police acted responsibly by investigating within the current context. There is an unhealthy focus on the Muslim community and coverage has been very unfriendly. It was not the first such programme to pursue a similar line of inquiry. These kind of irresponsible programmes damage community relations. Yes, there is freedom of the press, but that is no reason to target a select community in this way. I have now written to the DPP and the Chief Constable of the West Midlands Police asking for an explanation for the highly damaging allegations made in August – allegations that sought to undermine legitimate investigative journalism and that unjustly blackened the reputation of my company and my courageous and entirely honest team of programme makers. The Times carries a depressing story about Grayson Perry, the cross-dressing, Turner Prize winning potter, where he admits that he has censored himself for fear of violent reprisals from Islamists. The reason I haven’t gone all out attacking Islamism in my art is because I feel real fear that someone will slit my throat. With other targets you’ve got a better idea of who they are but Islamism is very amorphous. You don’t know what the threshold is. Even what seems an innocuous image might trigger off a really violent reaction so I just play safe all the time. Ofcom exonerates C4’s Undercover Mosque – slams police? The Mail claims to have seen Ofcom’s judgement on the unprecedented complaint by the West Midlands Police about Channel 4’s Undercover Mosque. Not only has C4 been cleared, but the Mail says that Ofcom has also taken the unusual step of directly criticising the complainant. If true, it may have something to do with the fact that the West Midlands Police had absolutely no right to make the complaint in the first place, as Ofcom’s rules state that “Fairness and Privacy” complaints can come only from “the person affected” or someone authorised to act for them. While it would be nice if the WMP were hauled over the coals for this egregious example of “gesture policing”, the good news is that C4 looks to have been completely exonerated. This is, of course, in accordance with MWW prophecy.